Since Jason and I began talking about comics, lo those many months ago, we haven’t really done any comics reviews. There are a couple of reasons for it, and he and I have discussed the issue at length. One of the reasons we’ve been shying away from doing actual comics reviews is that they are difficult to do properly. It’s very easy to pick a comic and discuss it, but so often what happens is that someone says, “Yeah, man, that was awesome!” or “Yo, dude, that sucked!” and there’s not much more to the conversation. You’re getting people who are simply skimming the surface of the comic, and picking out the most obvious successes or flaws in the work, but they’re not giving a reader anything of substance. I’m not really sure how much substance we have around here, but if we’re going to take the time to examine a comic in detail, I’d like to think that we’ll be able to explore that work in depth, for good or ill.
Another reason we’ve been reluctant to dive into reviewing comics is that neither one of us considers ourselves experts. We’ve been reading comics for years, and we’re both bright fellows, but I do not, by any means, have formal training in criticism. I am also not much of an art critic. I can normally delve into the other aspects of a comic (plot, pacing, characterization and the like) with at least a modicum of intelligent discourse, but when it comes to art, I fall more into the “I like it” or “I don’t like it”. I certainly have artists whom I prefer and a few whom I avoid, and I can articulate a few reasons why that is, but I’m not an expert. I know a lot about the field of comics (and some other fields), but I’m never sure if I’m exactly qualified to comment on the work of others in a public forum. Finally, Jason and I have been concerned about insulting creators. Whether or not I like the art of Ron Lim has nothing to do with whether or not I like the man himself; how could I say whether or not I like him, since I don’t know him. When commenting on a creative endeavor like a comic, sometimes the work and the creator behind the work both become subjects of derision during the discussion. Jason and I have both made some negative (some may say snarky) comments about the work of certain creators in passing on the blog, but we try to focus on the work and not the person. Hopefully our readers will keep us honest in the future, as we begin to start doing some actual comics reviews. The reason that I’ve written this overly long introduction to the idea of bringing reviews to this site on occasion is because I was one of the many people watching the recent blogosphere discussion that resulted when Noah Berlatsky at “The Hooded Utilitarian” blog reviewed 100 Bullets. Berlatsky was not a fan of the issues of 100 Bullets that he read, which is, of course, his right. What started the brou-ha-ha is that, during the course of his review, he complained about the art of Eduardo Risso, using one particular cover as an example; a cover that Risso did not draw (Dave Johnson did). Whoops! This mistake quickly attracted the attention of others. Heidi MacDonald of “The Beat” was probably the first to notice and comment on the error. She rightly points out that he used a different artist’s work to complain about one artist, but then she spends most of the post defending Eduardo Risso, which seems to detract from her main focus; Berlatsky made a mistake. From there, things snowballed, with others joining in to condemn Berlatsky, comics writer Mark Waid getting involved, and generally unpleasant comments being thrown back and forth. Why do I find this interesting? Well, this hits on some of the concerns that Jason and I had about doing reviews in the first place. Berlatsky made an error that I hope we wouldn’t make, but it’s not something that can be ruled out (although certainly this has made me more determined to check my facts before I post something in the future). Second, Berlatsky got negative comments from the blogosphere (although he did have his defenders), and many of those comments seemed to stem from his dislike of 100 Bullets. His review of the series was snarky, and that seems to have been what ultimately ran him into trouble; by confusing the artwork, he left an opening where fans of the series could defend it. Could his review have been less snarky? Sure, but let’s be honest, snarky reviews are more fun to read and to write. Heck, our entire website is built on snark (ok, maybe not built on, but certainly snark is one of our basic four food groups). The Berlatsky situation made me think it was important to preface any actual reviews with a few comments and answering the most crucial questions available to us: Who, What, When, Where, How and Why. Who: Jason and I. We’ll be doing the reviews, and that’s important, because different people perceive things in different ways. Reviews are subjective; I can give you every reason why you should love a certain piece of work, and in the end, it may just not appeal to you. I loaned Jeff Smith’s wonderful series Bone to a friend of mine, thinking she would love it. She was completely underwhelmed by it, and couldn’t finish the series. It simply didn’t appeal to her. Sometimes, this sort of thing will happen, so it’s important to make it clear that, no matter how eloquently you praise or attack a series, some people will have the opposite view. Don’t let it shake you up too much. Let us know if you agree or disagree with what we’re saying. What: Sometimes we’ll be choosing things that are associated with a current media adaptation, since people are more likely to be searching such works out. Sometimes it may be things we particularly like or dislike, in the hopes of drawing readers to them, or warning people away. In the end, we hope to be choosing works that will be of interest to our readers. When: As with everything else here, there will be no set schedule. I can’t see us doing reviews more than once every few weeks however. In the end, we are not a review site. There are plenty of those, and I’m not sure the blogosphere really needs one more, although I’d like to think that our dual viewpoint allows us to bring something different to the table. Where: We’ll be picking works from all over the comics universe. Yes, superheroes will have more than their fair share of space, but this will be a good place for us to draw focus to other works, some of them out of the mainstream and some of them dancing at the edges of mainstream. How: Oh, with snark. I’m not sure we have another way we can write, and again, it’s more fun for both us and you. However, like I said earlier, we’ll try to comment on the work and not the creator. Why: We’ll be reviewing things because we hope to provide readers with information on whether or not a comic is worth their time and money. In the end, we rely on all of you to let us know what you think. More reviews? Less reviews? Specific things you’d like to see reviewed? Agree with our comments? Disagree? As always, let us know. Let me chime in first by saying that I agree wholeheartedly with everything that John has put forward so far in this post. I would like to confess that one of the major reasons we don’t do more reviews, beyond the fact that there is already an overwhelming abundance of comic review sites (for both good and bad), is that neither John nor I read many monthly comics anymore. I know that probably instantly places us in some sort of lower tier in the eyes of many fans out there, but the simple truth is that…and I don’t want to get off on some sort of scolding of the industry here…most books that interest us, whether for plot or characters, seem to be written solely for the trade consumption. The comics medium has changed drastically in the last 10 years or so (to a greater degree in the last 3 or 4 years actually) and the pacing, both in the exposition and the action, has brought everything to the point where I usually only buy things once a month now instead of every Wednesday. And the number of titles I’m interested in (at least on the superhero side of things, which seems to be our bread-and-butter here) has dwindled from a few dozen to…just a few. Amazon gets more of my business these days than any neighborhood store, because of increased availability, lack of urgency and simplicity of shopping. And don’t even get me started on how much the online community has ruined, or nearly removed, the anticipation and suspense of the monthly comic cycle. But that is neither here nor there for this discussion, so let’s get back on topic, shall we? The recent revelation by JG Jones concerning his output on the Final Crisis miniseries at DC is another example of how online criticism can really go beyond the pale. Brian Wood pointed me to a CBR thread that facilitated the figurative drawing-and-quartering of Mr. Jones in the eyes of the fanboys. There’s no need for that kind of vitriol in any realm. I’d be tempted to go off on a political rant here about how our country is increasingly divided and angry, but that would bore everyone. Suffice it to say that personally attacking someone for drawing (or, in this case, NOT drawing) pictures on paper is both uncalled for and downright idiotic. If you aren’t happy with the finished product, don’t buy it. NOTE: Hell, if I were you I’d be more concerned with the confusing, meandering, languidly-developing, inside-speaking, continuity-muddled plot of the series more than how it’s graphically represented. No amount of Picasso or DaVinci can polish that mess. It’s completely inappropriate to praise someone for their work as long as it arrives to your liking and then immediately lash out at them once that work stops arriving. JG’s style didn’t change. His dedication to his craft isn’t lacking. He merely doesn’t have the time…and has, at the least, realized that and confessed as such. I’ve met JG Jones. I’ve talked to him. He’s not some horrible creature hiding in the dark and plotting ways to screw up your Wednesday buying habits. He’s an amazing artist who deserves some appreciation for the work he has produced. Admire it or don’t, but never cast stones at him for admitting a weakness or a mistake. Now John Byrne? That’s another story altogether. ZING! Since Jason mentioned it, I’ll confess that I don’t read ANY monthly comics pamphlets at this time, and haven’t for about two or three years. I buy five to seven trade paperbacks a month, some of them current, and that more than keeps me spending enough money on comics (I still support my local comics shop when I buy them; yes, I could get them cheaper elsewhere, but I always prefer to support locally owned small businesses, and Ralph – my local comic store proprietor – is a heckuva guy!). I also spend a lot of time online, and thanks to the fact that no surprises are allowed in comics anymore and must instead be announced in various internet sites months before publication, I can follow the plots of any series I wish (and often large chunks of issues are posted to read; I do NOT pirate comics and don’t recommend pirating anything online. Yes, it may make me seem old and fuddly-duddly, but I can live with that). I’d like to think I’m quite caught up with the goings-on in the superhero universes, and then I read most of these comics a few months in the trades after the pamphlet reading public. As for the JG Jones news, I can’t say I’m surprised. I absolutely love his artwork; I think he may be one of the best pencillers out there. However, he’s not someone who works quickly, so why oh why would DC have hired him to do this miniseries in the first place? I have something of a gripe against so many comics being released late; I think it hurts the industry when it happens, and it can certainly hurt a lot of comics. Often, it’s the pencillers who get the bad rap for working slowly, although that’s not always the case (Kevin Smith, my peepers are squarely trained at you! ), but really, what is management thinking? I’m not saying not to hire JG Jones; that would be crazy! The guy is good! But don’t hire him to do the pivotal miniseries on which your entire superhero line rests. There are plenty of excellent pencillers to do that series. Let him do an ancillary miniseries, if he wants to be part of Final Crisis; a miniseries that isn’t central to the plot or can stand on its own. So, yes, attacking someone like JG Jones is silly. The man’s doing his job to the best of his ability and he’s not trying to ruin anyone’s life. That’s the sort of thing we won’t be engaging in. But, how did I know you’d have a John Byrne comment before we finished? Of course, Byrne is an example of how some creators put themselves out there in a public forum, and at times almost beg people to dislike them. I still try to tread carefully in those cases, but I’m sure that we’ll run into those situations, particularly in the case of an outspoken creator like Byrne (although he seems to have been somewhat quiet lately). 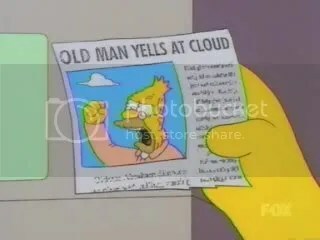 Granted, that image works just as well for nearly every naysaying fool posting on the web. That’s most likely the problem with the majority of poorly executed comic reviews: they’re set forth by nameless, faceless people who are only seeking the hive-minded approval of other nameless, faceless people. The anonymity and temporary status afforded by message boards and blogs allows people to say stupid things with nearly zero accountability or retribution. Spit out whatever mean-spirited thing you’d like and I guarantee someone will read it and laugh, or worse, try to one-up your horrendous attitude and insults. We shall tread carefully. We are under no illusion that anyone out there should agree with us. Heck, we often don’t agree with each other. But at least we aim to provide lucid grounding for that disagreement, with examples that back up those opinions and a willingness to concede the smaller differences. There shall be no name-calling or references to each other’s mothers and farm animals. We will never threaten to hunt each other down or punch each other in our respective faces because of words exchanged on an imaginary playground in a digital land. Besides, we still meet for dinner at least once a month and that would just make things awkward. I think it’s also important to point out that our focus is unabashedly on the superhero genre. Sure, we read other things and those things influence the way we view and read comics in general. But, and I’m not sure John illuminated this point enough, we will always write with an eye towards the whole hero/villain scene. If you don’t like that, or wish to bemoan the societal downfall of the genre, do it elsewhere. Sure, superhero comics can be immature and stunted and obtuse and mired in the various cliques and coteries of the industry (and I’m sure we’ll call for their heads once or twice), but they helped form our childhoods. I, for one, will never fully turn my back on the colorful exploits of these powerful characters. Of course, by the time this post is disseminated to the general public, I’m sure that someone else will say something stupidly critical that we can call out as the “wrong way” of doing things. If you think the plotlines in certain comics are predictable, take a look at some of the “fan” reactions when you have a spare week and some self-loathing to spare. I shan’t continue to belabor these points, but instead I shall take this opportunity to disagree with Jason, at least a little. I agree that, yes, superheroes are our main focus, and no, I don’t feel like I need to apologize for them. There’s certainly a ton of absolute rubbish in the genre, but there’s some great stuff too, and it doesn’t take too much searching to find it. That being said, I do plan on branching out a little, if in reviews only, to touch on some of the non-superpowered comics out there. Now, Jason left the door open for that, at least somewhat, by saying we’d focus on the hero/villain thing, and if that’s our focus, it allows us to still do all sorts of non-superhero comics. While I’ll always love superheroes, there’s some other amazing stuff out there that I’d like to discuss with our readers, from the almost mainstream Usagi Yojimbo or Queen and Country, to perhaps the slightly more obscure Action Philosophers, Scott Pilgrim or Barry Ween. But otherwise, I’m in total agreement with Jason. I’m not sure when the first reviews will show up here (perhaps next week), but at least the groundwork is laid. I believe that Jason and I will both admit that we do more Marvel posts than DC posts. That being said, I do enjoy the DC Universe (even if it’s current direction leaves me cold) and so, along those lines, we want to explore those characters more often. So, we thought we’d start by using the most famous DC team of all time for one of our infamous Dream Team posts: the Justice League! Many people might consider the Dream Team of the Justice League to be pretty self-explanatory; it’s the big seven, the founding (pre-Crisis) members, and the ones that Grant Morrison used during his run. That august assemblage included Superman, Batman, Martian Manhunter, Aquaman, Wonder Woman, Green Lantern and Flash. I have to disagree, however. I think that there are a lot of really interesting characters that serve better on the league than many of the big names. However, I do want to steal the number of heroes, and cap our team off at seven members. For those familiar with the Justice League, let’s start a little wager: how many of my team members will be from the Detroit era of the JLA? Place your bets now folks! First, I’d choose the one character who I feel is an indispensable member of the league: The Martian Manhunter. Yes, he’s currently dead in the DCU, but really, how long can that be expected to last? I think the Martian Manhunter is the heart of the JLA, much like Captain America is the heart of the Avengers, and I feel the team is always stronger when he’s a part of it. He’s in. I also am going to keep one other member of the classic group, and that’s The Flash. Yes, Wally West does well as a member of the Teen Titans, but he’s been a member of both groups in the past, and can be again. He’s actually one of the few characters in comics who, I think, works equally well in more than one supergroup, and can actually be considered a vital part of both. Next up is a personal favorite of mine, Mr. Miracle. He was a member during the Giffen/DeMatteis days, and I thought that he managed to make it through their run with his dignity intact, which was not always an easy task. He is far and away my favorite of Kirby’s Fourth World characters, and I think he brings a hefty dose of skill into the League, a group that normally subsists more on raw power. If you’re not including Batman in the League (and I’m not), then you truly need someone who understands subtlety and finesse. Mr. Miracle fits the bill. My fourth choice is a character who, for years, I had no respect for. I considered him largely useless and somewhat silly. However, over the past few years The Atom has begun to really grow on me. I think some of that may be his strong showing in the Justice League Unlimited cartoon, or perhaps I’m growing up, and I’m beginning to realize that, as with Mr. Miracle, raw power isn’t everything. The Atom also supplies the League with a scientist, which is rare in the League. Every third Avenger seems to be a scientist of some sort, but not so with the JLA, and that makes the Atom that much more unique. Fifth I choose The Red Tornado. I’ve always liked his look, I think his powers are neat and different, and I enjoy the element of the synthetic man trying to fit into a team of flesh and blood heroes. Hey, I’m a fan of the Vision too; what can I say? Someone who is on the outside looking in resonates with me. I’m going to throw in a young rookie; when we discussed the Avengers, Jason suggested that every team needs a young hero for the other heroes to mentor. I’m not sure if I agree with that (I pooh-poohed the idea at the time), but there certainly can be an interesting dynamic between an inexperienced hero and those who have been saving people their entire lives. I choose The Ray for that honor. I’ve always enjoyed the character, I think he has an amazing look, and he’s certainly powerful enough for the JLA. He worked with the Martian Manhunter quite a bit as a member of the Justice League Task Force, but he still has a lot to learn. Finally, for my last choice, I’m going to pick someone from near obscurity: Animal Man. He was a member of the Justice League Europe team, but only lasted about ten issues, since Grant Morrison was turning his life upside down in his own comic at the time. I’ve always enjoyed the character, and I’d like to see what he could do on the team if he was actually given the chance. So, I have Martian Manhunter, Mr. Miracle, Flash, the Atom, Red Tornado, the Ray and Animal Man. I’d love to have Atom as the leader; I think he’d do a good job, and it would make for a more interesting team dynamic then using Martian Manhunter, the next logical choice. How many member did I choose from the Detroit era? Just one: the Martian Manhunter. I really tried to fit Vibe into the group, but sadly, it wasn’t meant to be. It’s tough for me to rationalize throwing a dead guy into the mix, but to each their own I guess. Did Vibe have any superpowers beyond being stereotypical and annoying? And what’s with shunning all the females? Look, as much as I praise Marvel for pretty much shaping my childhood imagination, I have to give some of the credit to the Justice League as well. With the exception of a few issues, I have a run of Justice League of America comics that starts around issue #40 and goes straight through to the end of the Detroit years. Add to that a hefty run of Giffen’s Justice League revamp (later renamed Justice League International and then Justice League America), a complete collection of Justice League Europe (which, correct me if I’m wrong, was also then renamed Justice League International? That’s confusing) and a substantial portion of the later JLA series and you could easily conclude that I’m a HUGE JL fan. I agree that the original seven members of the JL were probably considered the Dream Team at the time, since they consisted of all of DC’s major characters, including several well-received Silver Age revamps (Flash and Green Lantern, specifically). However, I also agree that just because they were big names didn’t necessarily mean that they should play together on a team. I find the iconic status of the “Big Three” to be rather daunting when it comes to building an effective network of heroes. Really, why do you need anyone else, aside from the sheer numbers perspective? A team like that doesn’t lend itself to creative storytelling. I would guess that my biggest influences, when it comes to who I believe deserves to be in the ultimate JL lineup, are the “satellite years” and the team that launched out of the Legends miniseries. These were some of my favorite 70s and 80s characters and, to this day, some of them are still woefully underused. John said Martian Manhunter: Really? THAT’S your marquee selection? Blah. Aside from the running joke of him being obsessed with Oreos, I just never really related to J’onn. I’ve always felt that he was a good teammate, but whenever the focus is on him I can’t grasp a connection to him. I know that he’s been repeatedly set up as team leader, but the subordinate relationships away from him were always more interesting. He’s also become one of those characters whose powers continue to evolve and change to the point of being ridiculous. Thankfully, he’s dead (for now) and I think that really takes him off the table. My pick for the “legacy” position would be Green Lantern (Hal Jordan). He has the military/tactical background to be a true leader for the team, his fearlessness has been tested, and the visual potential for his powers really lends itself to a good creative team. John said Flash: Agreed 100%. Wally West has consistently been one of my favorite DC characters. I think his powers are essential to a strong team. Plus, Flash lends a mix of youth and experience that few other DC heroes possess. John said Mister Miracle: Also agreed, as long as it’s Scott Free in the costume and not the recently relaunched urban Shilo Norman version from Grant Morrison. Mister Miracle always struck me as one of those reluctant types who was a hero out of necessity instead of virtue. I like that dynamic. John said The Atom: I’m sorry, I just never got a good feel for Ray Palmer and the new guy in the costume hasn’t done much for me either. I like the unique powers of Atom, but he has no resonance for a major hero team…kind of like how Ant-Man doesn’t really fit well in an ultimate Avengers lineup. If we want some unique powers with a personality, I think we could do worse than to look at Plastic Man. Eel O’Brien is an old school member who has sort of come and gone under the radar. He has a dark past but a lighthearted persona, and I feel that that dichotomy is worth exploring. John said Red Tornado: Again, I have no real feeling for this character. He looks cool and the concept of a synthezoid hero is intriguing, but the “woe is me” emotion-based, Pinocchio-like storyline that Brad Meltzer recently rolled out left me cold. I would rather replace this choice with a female, just for contrast. I was leaning towards Wonder Woman, partially for the iconic feel but also for leadership reasons. However, I think the softer Zatanna would be more appropriate. The self-doubt she has recently demonstrated adds a certain vulnerability to a character who was never completely strong to begin with. And she has pretty nebulous powers that could be exploited nicely. John said Animal Man: Curious. He was on a short list I scribbled down and, by process of elimination, ended up being in my top seven too. With Captain Atom and Doctor Fate both being out of commission right now and Firestorm not the same character he used to be, Animal Man is my default choice for this position. I think by assembling the widest range of powers possible, we show a true cross-section of the “global reach” of the team. John said The Ray: Yeah, I could see this pick working out nicely. He’s got a bit of the legacy going on and he’s a pretty powerful hero when he can stay focused. It’s a good selection for a young, mentor-able character. However, I would like to throw out a more controversial name: Resurrection Man. Very interesting powers and an underdeveloped history lead to broader interactions and plot possibilities. I could almost see the team sort of “finding” him somewhere and bringing him along as a pet project, like cleaning up a homeless guy on one of those makeover shows. There’s a lot of potential in the character. So, to sum up, my Justice League Dream Team would have Green Lantern leading a group comprised of Flash, Mister Miracle, Plastic Man, Zatanna, Animal Man and Resurrection Man. I worked a woman into the team. There’s one character that can definitely fly, one that can hover on special gizmos and one who can fly if the appropriate animal is nearby. I’ve got magic powers, speed powers and stretchy powers (two if you count GL’s shape-making ability). About the only thing not covered is a true strength-based character, but I’m okay with it…and Resurrection Man could cover that area depending on the circumstances. The biggest problem I can find is that I have three heroes with the word “Man” in their names…someone feeling insecure with their sexuality? I anxiously await your almost certain rebuttal. I can not believe that I neglected to include any women in the group. Huge oversight. Wait. Hal Jordan? Hal freakin’ Jordan? The most boring character in the DC Universe, in any time period? I’m one of those people who agreed 100% with DC removing Hal from his position as Green Lantern, although I disagreed 100% with the way they did it. Making him a mass murderer and psycho did not make him interesting; it made him an ugly plot device. I have no problem with there being a Green Lantern on the team, and can even partially agree that a Green Lantern on the team is necessary and iconic, but Hal Jordan? Please God no. Pick another GL. Goodness knows there are tons of them. John Stewart or Guy Gardner would be fine, although my choice would be Kyle Rayner. I won’t bother to argue the Martian Manhunter point, except to note that he’s been involved with every incarnation of the JLA except for the current one, and Green Lantern has not. Yay to Wally West! Might I point out that he has a very good relationship with Kyle Rayner? Yay to Mr. Miracle. While I don’t hate Shilo Norman, I agree that Scott Free is the one, true Mr. Miracle, and my choice for the costume. I like Plastic Man. I think that, in losing Atom, we lose our most intelligent and scientific member, but I can deal with that, since that’s never been integral to the JLA anyway. If you get a good artist, Plastic Man can be one of the most visually fascinating characters on the page (as a side note, another visually fascinating character for a good artist? Kyle Rayner). I can lose Red Tornado. However, I hesitate to replace him with Zatanna. I normally love magic based heroes, and the group does need a female, but I have never liked Zatanna. First of all, considering your feelings about magic evinced in our Dr. Strange entry, I can’t believe you’d be ok with her powers, which are even less defined than Dr. Strange’s. She seriously has no structure or limits to what she can do. Second, as a character I find her rather dull and difficult to relate to. Her recent self-doubt stems from her making that absolutely atrocious decision in Identity Crisis, a decision which makes her one of the more loathsome characters in the DC Universe, and with the current competition for that title, that’s saying a lot. No, there must be a better female character for the series. I would be tempted to nominate Wonder Woman, as I truly like the character, and think that she’s more interesting when she’s not around Superman and Batman. Free to interact with the other members of the team without the two main guns of the DCU horning in and trying to dominate her time on-screen, I think she could add an interesting element to the mix of characters in any team. However, she’s still one of the trinity of holy characters at DC and you’ll never be free to do as much with her in a team setting, since the constraints of her own book tie her down. Plus, we have two members of the Big Seven already, so I’m not sure how necessary she is. As I work through the female options for the team, I’d like to point out how few females have been members of the JLA. Seriously, compared to the Avengers or the X-Men, there aren’t a whole heck of a lot of them; I don’t think any incarnation of the team has had more than one or two on the team at a time. I have a few that I’m thinking of for membership, but I’m going to start by suggesting Dr. Light. I always liked her, although I preferred her as the somewhat short tempered and angry Dr. Light that she started as, rather than the rather weak milksop she was by the time Justice League International ended. Still, she has a great power, and I think she could work. Hmmm. I expected the Ray to be shunted, and he actually did better with you than expected. Resurrection Man comes out of left field, for sure. I loved the character and his series. My biggest problem with him is whether or not you’re breaking the rules of Dream Team entries by introducing a character who’s never been a member. Aren’t there enough Leaguers around to choose from without dragging in a new character to add to the roster? I’m going to wait to see what your thoughts are, and we can go from there. So, as Round Two comes to an end, we have some confirmed team members: Flash, Mr. Miracle, Animal Man and Plastic Man. We’re over halfway there! Now we need you to pick a Green Lantern who doesn’t make me fall into a coma everytime I read his adventures, decide whether you like Dr. Light and give me a ruling on whether Resurrection Man is a fair pick. Wow. We don’t usually agree this easily, huh? You must be coming around to my superior way of thinking. I am an enlightened human being. Please, keep your praise to a minimum. I’ll wait. All done clapping and fawning? Okay then, let’s get this wrapped up. I’m going to make a group of decisions all related to one another right here and right now. I think this will make sense in the end. First of all, I concede the GL pick to you. Kyle Rayner is in. He has a great relationship with Flash and gives us that extra firepower. My only problem with him is that he’s all wrapped up in the GL Corps as their version of Neo from The Matrix. That’s both annoying and troubling when it comes to his availability. But I can live with it and he makes the most sense. If we remove Hal Jordan, then we’ve lost the senior leadership of the team. To that end, and to bring in a female character (because I don’t feel that Dr. Light plays nice here considering the implications of her villainous male counterpart), I suggest we do add Wonder Woman to the team. She’s a strong leader and, quite honestly, her solo series always seems to be written in a different universe anyway. 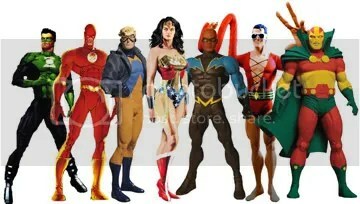 I have a feeling that any team we would end up assembling would focus more on the relationships of the younger characters and Wonder Woman will be there as more of an advisor and extra hand in battle. Now, to your final point, I could make an argument to include Resurrection Man. A little more than two-thirds of the way through his eponymous series, he was offered probationary status in the JL. It’s also been said that he and Vandal Savage have been fighting each other for generations…which would make for a pretty cool storyline involving the Justice League. However, the more I think about it, I’m not sure he’s up for teamwork. Sure, his power would be fascinating to investigate and develop in the heat of battle, and he could probably tell some great stories, but he’s not really grounded in the mythology. So here’s where I argue with myself over the necessity of including a “rookie” character. We all know that the Marvel and DC Universes are inherently different. Marvel is all about “real” characters with flaws and weaknesses. DC has always portrayed an iconic status in its heroes. You could get away with putting a young turk on the Avengers…making them prove themselves, showing the team helping to develop the next era of hero. But the Justice League is about being the best immediately. People rely on them. It’s no place to toss a greenhorn. That’s why I’m going to voluntarily withdraw Resurrection Man. However, I don’t want to automatically bring back in your suggestion either. The Ray is, technically, part of the Freedom Fighters and they probably need him more. No, I’m going to nominate someone who has been around for a long time, has a somewhat similar power to The Ray, is a current member of the JLA and definitely ups the diversity factor of the team: Black Lightning. I think that explanation came together nicely. So, my round two decisions: Wonder Woman leads a team composed of Green Lantern, Flash, Mister Miracle, Animal Man, Plastic Man and Black Lightning. Strange. Just looking at the names, it has the feel of two different teams being stitched together, but not in a bad way. I argued with myself about whether or not to bring in Wonder Woman, and while I decided no at the time, I’m fine with her being included now. I also love the idea of her being the team leader. Theoritically, she led the team one other time, but it was a rather lame team, and she didn’t do much actual leading (until the awful crossover where Ice died, and then she acted like a moron, just like almost everyone in the League at the time). She’s definitely in. Black Lightning. It is something of a slam dunk, isn’t it? He’s smart, he’s got great powers, he’s adds some diversity and he has an interesting personality. I think he’d make an excellent addition. In the real universe, I’d want to ask his creator, Tony Isabella, for his blessing, since I understand there has been some….let’s call them disagreements between Isabella and DC Comics on who actually owns the character (DC claims Black Lightning was created under a work for hire agreement, which Isabella stridently claims was not the case) and while I don’t have facts on which side is correct, we certainly can look at historical precedent to see what sort of track record DC has with playing fair with creators. That being said, this is a dream team, and hopefully Tony Isabella would give the okay, so let’s include him. Wonder Woman. Green Lantern. Flash. Mr. Miracle. Animal Man. Black Lightning. Plastic Man. I really like that group. You have skilled superheroes who’ve been doing this for years and legacy heroes who have come into their own; you have heroes with tremendous power, and some who trade more in skill; you have heroes who come from a regal background and some from an urban environment and one from another planet. It works for me.